Viberate.com – the new music analytics service launched last month as a free beta – has now announced details about its free and premium tiers. Granting users access to an apparently unprecedented level of statistical data, the site offers unique insights not only into artists’ current standings within the industry, but also rising trends, allowing promoters, agents and managers to be one step ahead of the competition. Thanks to regularly refreshed data from a huge range of sources, its aim is to chart the predictive rise and fall of artists based on real time activity, meaning that promoters can discover and book soon-to-be superstar artists before they become prohibitively expensive. Another key feature of Viberate is that it allows artists to take control of their own careers, charting which releases and events give their profile a boost and reacting quickly to changing trends. 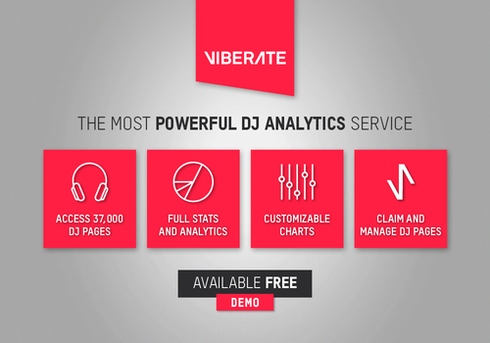 The Viberate Premium account currently gives users access to insider data on over 37,000 DJs, along with their full statistics and charts, and is a ‘priceless tool for music professionals’, while free demo allows them to test the product free of charge with limited features. Premium users can also claim and manage an unlimited number of pages once artist affiliation has been confirmed. Once claimed, they can edit all the information displayed and soon they will be able to network directly with other professionals: an invaluable tool for managers, agents, publicists and artists alike. Monthly subscription to all Viberate's features starts at just $14.96 per month. Viberate’s Free tier limits access to a Top 100 chart and allows access to stats for the first 10 artists on overall chart. Free users can claim and edit basic info on an artist’s page, useful for aspiring DJs who want to be in control of and chart the progress of their career. In addition to the Artists feature, the platform will soon be adding more than 25,000 labels and 30,000 venues with the similar level of information accessible for both, aiming to make it a one-stop shop for music professionals in need of an overview of the electronic music ecosystem. Check Viberate.com for more info.